We love to hear about our users’ success preventing crime. 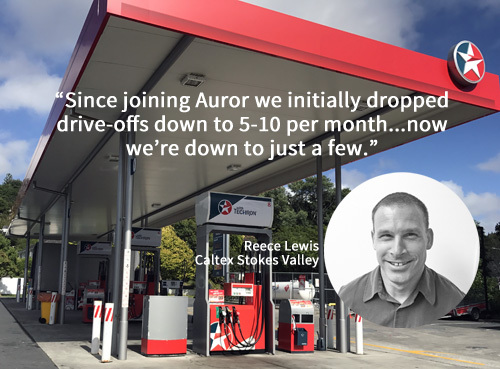 So when Reece Lewis from Caltex Stokes Valley got in touch to share his experience reducing crime at his petrol station by nearly 80%, we were rapt. His story is a classic case of using technology to respond to rising crime rates at his site in a smart way, and we were so impressed that we’ve shared his story in a brand-new case study. In truth, Reece has always been a bit of a crimefighter. For 12 years he was reporting crime incidents at his site to the local police and doing what he could to keep criminals away. But it wasn’t until he added Auror and ANPR technology to his site that he started seeing a massive difference in his prevention programme. After adding new IP cameras and an ANPR server to his petrol station, Reece had Auror tie it all together so that his staff could work in a smart way to prevent drive offs, getting automatic alerts whenever a vehicle arrived on-site that had done a drive-off previously. It’s a brilliant demonstration of the full capability of our platform to prevent fuel theft. We don’t want to give it all away, so be sure to download the full case study below for the full details from Reece and his team. Contact us today to find out how we can help prevent fuel thefts at your site.